This week we're featuring the awesome office of Kevin Forch, Student Success Coach at Southeast Community College. Thank you so much for showcasing my work space on your site. I've been a fan of superheroes and comics since my elementary school days when a lot of my allowance went towards Spider-Man and all those mid 90's X-books (X-Men, Uncanny X-Men, X-Men Adventures, X-Force, Excalibur, Generation X...you get the idea). What I love most about these books is that (even now as an adult) they have been a great way to connect with friends by sharing books, discussing at length our thoughts about plots/cliffhangers/characters, and fiercely debating which of our favorite heroes were the best (Batman/Superman, Wolverine/Cyclops, Krypto/Lockhead). There are a couple key reasons I like having these figures at my desk: 1) They are awesome to look at. They're a good pick-me-up for times that I'm frustrated or lagging. 2) They make for a great icebreaker. Even for people who don't like comics, they can make for a starting point for conversation that helps to put a student at ease. Working in Retention and Student Success, I meet with a lot of students who are struggling in their classes or returning from a suspension. My office is not a place they probably envisioned themselves being when they started their academic journey. It's my hope that placing these items prominently on my desk gives a visual indication that this is a safe, relaxed place. If students are more at ease, we can easily work together to plan positive strategies for their academic success. Additionally, working at a community college means that I work with a lot of adult students, first generation students, and other populations who may need extra support. Reading texts like 'Unequal Childhoods' and 'Educating by Design' allowed me to see how difficult it can be to get at-risk students the support they need, either due to not being aware of the services we provide or not being sure how & where to ask for help. By providing a safe/fun/at-ease environment, it's my hope that our office provides a welcoming space for students who want to get back on track and build their academic skills or find community resources that could help them. 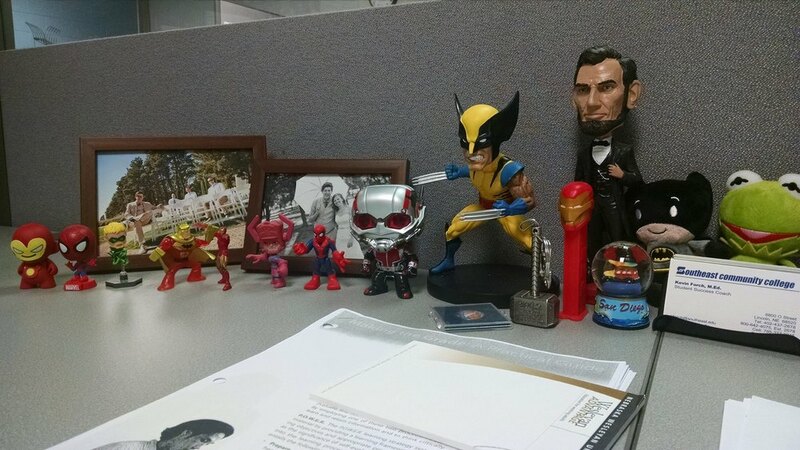 So, that's why I have a giant Wolverine on my desk!" What I really like about Kevin's office is his understanding of his student population as well as his emphasis on comfort. Serving adult learners and really college students in general often has us as student affairs professionals needing to make people feel less anxious and more willing to ask for help. Many people don't ask because of pride, some because of ignorance of what is available to them or perhaps where/who to go to. Kevin does what he can to compensate for this by simply helping people feel more comfortable with asking for help, which we all need sometimes. It makes me happy that some geeky toys on a desk can do this and how it also allows for Kevin to showcase some of his personality at the same time. Many thanks to Kevin for sharing his space with us. Stay tuned for more awesome offices in the coming weeks!